The tented arch and the arch comprise about 5% of fingerprint patterns found on the human finger tips and thumbs. The tented arch has a ‘tent pole’ thrusting up from the mound at the base in the middle of the print. See the example below. Your fingerprints were permanently carved into your fingers and thumbs in utero 16 weeks after conception. Look at your own fingerprint patterns and see if you have any tented arches. If you see tented arches, count how many reside on your finger tips. Not everyone has tented arches. 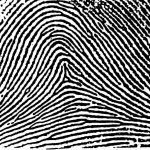 Part one and two of this article series identified the whorl and the loop which account for about 95% of the fingerprint patterns. The arch will be discussed in part four of this series. According to Richard Unger’s LifePrints, if you have one tented arch you may be in the school of “Wisdom”. If you own two or more tented arches you are definitely in the school of “Wisdom” where you are developing your skills to take risks and fully experience life with joy. As a Master of Wisdom you are able to quickly discern and initiate appropriate action. Vernon Mahabal, Director of the Palmistry Institute, declares two or more tented arches dwell on the finger tips of the Enthusiasts. Enthusiasts are those who tap into their self-initiation skills, stay motivated and inspire others as leaders. I combine the two descriptions into “The Wise Enthusiast” as one who moves from observation and evaluation to action, follow-through and commitment. If you have two or more tented arches you are developing the skills of discernment, decision making and the risk of powerful participation in the world. You’ll learn through being over dogmatic, over analyzing and feeling the need to be absolutely correct before proceeding. Life experience requires those on the student path of Wisdom to experience the bumps of procrastination, doubt and making excuses along the way. The student may also swerve between doubt and dogma to get to powerful participation, knowledge and understanding, and then repeat the cycle over and over. Toggling between uncertainty and ridged beliefs is a pure indicator of successful trail blazing for Wisdom. How could one become wise without taking action and learning from mistakes? Acquiring the skills of ‘diving in’, ‘taking the plunge, and ‘just doing it’ puts one on the Master Path of Wisdom. The sacred work is to bounce through hesitation and vice-grip-beliefs to recalculate the navigation system for Wisdom with Enthusiasm. The tented arches belong to the courageous Knights, Heroines, Crusaders and Leaders who have suited up in armor and dared to battle. The key to happiness on the life path of Wisdom with Enthusiasm is to enjoy one’s self during the knowledge gathering and utilization process. While we’re actually all on the life path of Wisdom, those with two or more tented arches have chosen, from before birth, the opportunity to delve more deeply into the lessons on the student path. Yes, it’s a bumpy road on the campus of Life. Monster trucks are designed, built and thrash over those gnarly bumps. You can too. Just do it and live on the Master Path! To learn more about hand and fingerprint analysis or to schedule a private reading in person or over the phone use the Contact Form to make your request.